A couple months ago my friend and I decided to start our own structured and fun program for our energetic, eager-to-learn pre-schooling boys. So every Monday morning we take turns teaching. This has been amazing for a number of reasons. 1. Our sons are loving the activities and new information. 2. 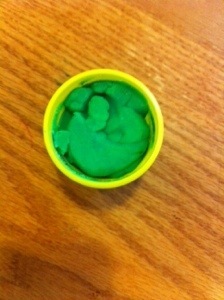 Every other week we get the chance to have 2 hours with our younger children or cleaning/personal time. 3. Our boys are learning from someone other than their parents occasionally (but in environments that we trust and appreciate) and are getting prepared for school. 4. It’s free and only means approx. 3 hours of lesson planning/time with the boys every two weeks. We decided to start with an animal theme and work through the alphabet from start to finish. When I’m planning my lesson I try to incorporate a number of subjects/learning points and keep the boys’ attention by having a combination of active, calm, hands-on, listening, visual and musical activities. 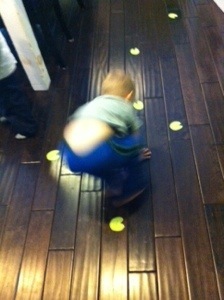 We started by pretending to be frogs and jumping on lily-pads I had made out of construction paper and taped to the floor. 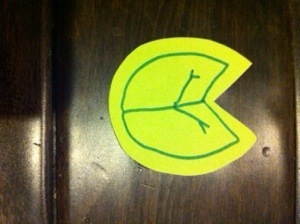 While doing this we talked about our topic for the day: FROGS! 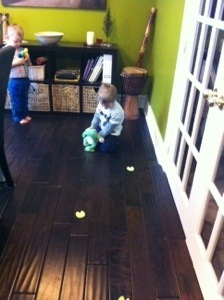 Then we used a stuffed frog to jump on the lily-pads and count them one-by-one. 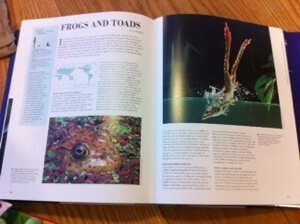 After this I taught them the upbeat, action song “mm mm went the little green frog one day”. 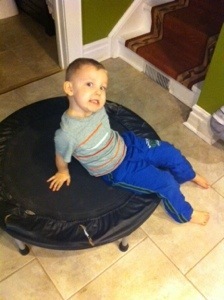 Then I let them have some frog jumping time on the trampoline. This was followed by some green play-dough frog construction, which helped them not be distracted while I talked about frog habitats, attributes and diets. Then we looked at some pictures of frogs in my great animal encyclopedia and learned some interesting facts, while naming some of our own experiences with frogs (like when dozens of them were climbing up Jeremiah’s window in a rainstorm). 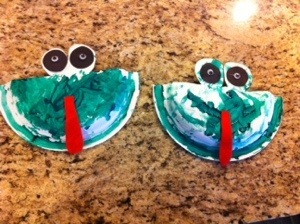 Then, the boys painted paper plates I cut to look like frog faces and I added googly eyes and red felt tongues. 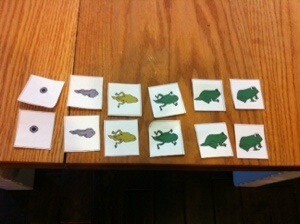 We also talked about frog life cycles, while practicing matching and sequencing. 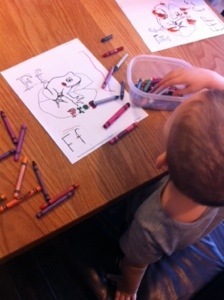 After that we talked about the letter ‘F’ / ‘f’ (it’s important to show both upper and lower case) and practiced tracing and writing the letter, as well as saying its sound. 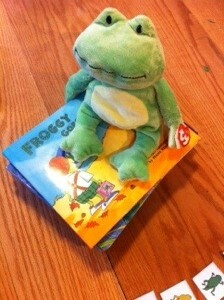 Then we finished off our two hour preschool time by reading “Froggy goes to school” and pointing out the things that were accurate (he eats flies) and inaccurate (he wears clothes) yet funny. I know that sounds like a lot, but it’s hard to keep their attention span for very long, so we’ve had to have lots of simple activities planned to keep them occupied. It really doesn’t take that much time though and I find myself learning a lot in the process too and really having fun! Feel free to fire me any questions or comments you may have. You’re amazing, but one correction…it’s actually my animal encyclopaedia – but I’ll share with them…I guess. LOVE this lesson plan. Would love to hear the other ones you had planned from A-Z! Thanks so much! Unfortunately we never made it through the whole alphabet and as this was a couple years ago, I can’t fully remember all we did. Sorry about that. Maybe I’ll figure something out like this another time and post about it.